Complex Systems often span multiple organisations, which requires that components act autonomously in a decentralised manner, as each organisation may have disparate and possibly contradictory goals and technologies. Adaptation is a fundamental requirement to achieve this as both the scale of these systems and the heterogeneity of goals necessitate a reactive and proactive approach. The Smart Grid is a typical example, unpredictable renewable energy sources require components that can adapt to changing environments as well as the myriad of dynamic conditions found in such systems. 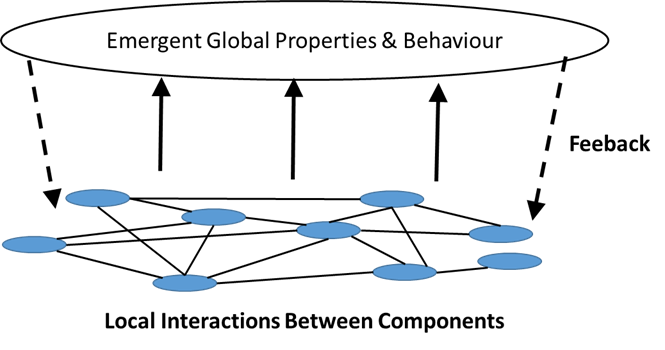 Emergence of complex behaviours from small-scale local interactions are a hallmark of smart city-scale systems. Unpredictable global features and behaviours distinct from those at the local level can emerge e.g., traffic conjestion or trends in electricity usage. Undesirable or unaccounted for emergent behaviour can prevent components from achieving their local goals. Existing adaptation frameworks are ill-equipped to detect and steer these emergent features. As they depend on centralised control or global knowledge of the system state, both of which are infeasible in smart city-scale systems. The multi-agent system (MAS) domain has experience in decentralised systems, and it can provide a foundation for a decentralised adaptation mechanism. In this work, we investigate augmenting a centralised predictive adaptation framework, TimeAct (TA), with a distributed reinforcement learning technique, Distributed W-Learning (DWL). Combining these frameworks provides decentralised control; proactive, timely adaptations; heterogeneous, autonomous components and a communication framework that allows collaborative behaviours. 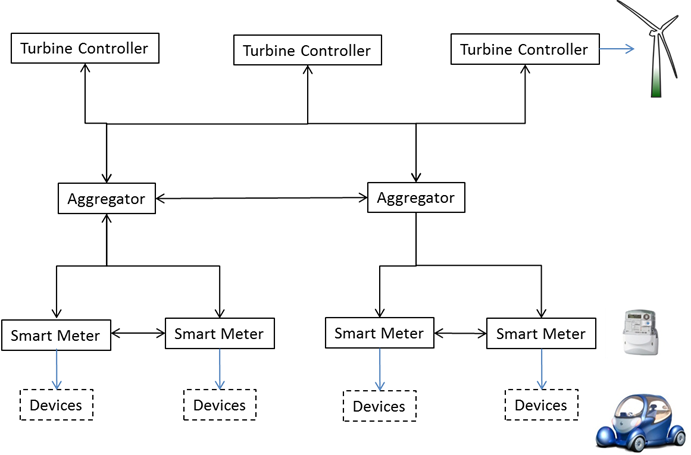 Consumption of wind energy is an emergent feature in the Smart Grid. 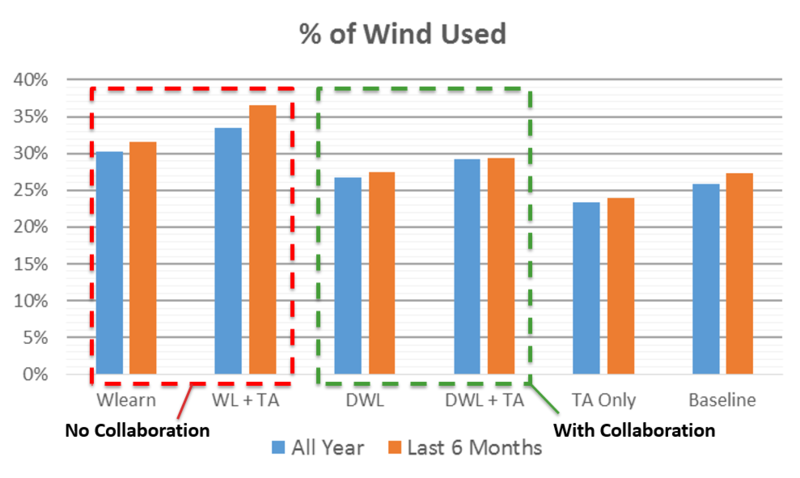 No collaboration between components produces the highest exploitation of wind, with predictive adaptation further improving results. 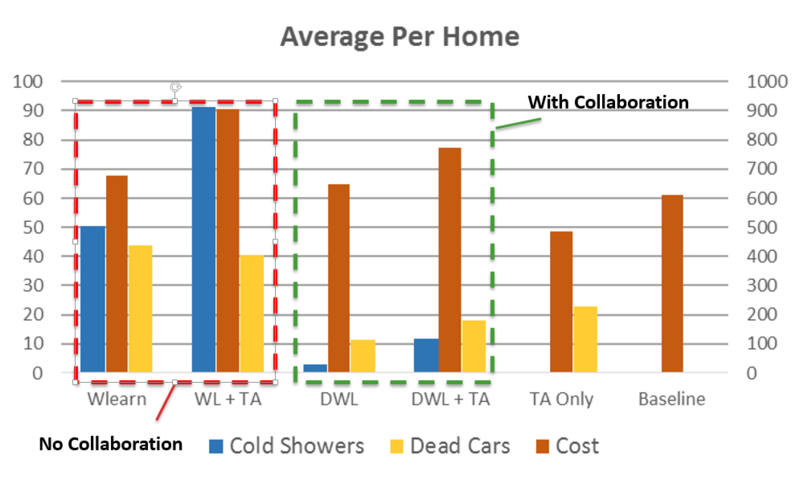 Domestic performance, measured by user utility and average cost, is significantly better when components collaborate. Collaboration impacts local and global results differently, whilst predictive adaptation provides further improvements. Future work will investigate ways to detect emergent behaviour, and implement cross-component adaptations to steer it.